There are many things you can do than help the hungry. And we’re here to help open the door. At The Guyer Institute and Synergy Spa, we pride ourselves on helping our patients stay healthy. Staying well-fed with proper nutrition is an absolute necessity for good health. There are many thousands in metro Indy alone who don’t get enough of the right foods to eat. They need others to notice them and care. The Monday after Thanksgiving, The Guyer Institute and Synergy Spa will begin its seventh annual food drive. It runs November 27th until December 29th. You certainly don’t have to be a patient to help the hungry. Our goal: 500 pounds of goods we can then transport to area food banks. You can donate non-perishable items Monday–Friday from 9am to 5pm in our supplement store. We all cross their paths. Mothers with young children at the discount stores. They struggle to pay for school clothes. Some can’t afford even one meal of healthy food a day. We see people on the streets: lined up at homeless shelters, soup kitchens, churches, and food banks. Teachers see children who are hungry in school…every day. 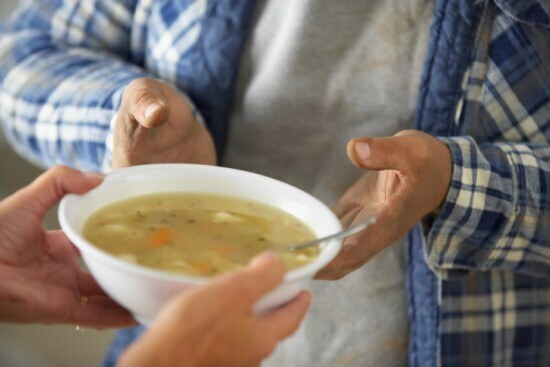 Nurses see the elderly at hospitals who come in sick – and hungry – every day. There’s a 10% discount on our supplements for those who bring one to four food items. Five items or more, and we’ll offer a 15% savings. It’s an easy decision to go by the grocery store in the next few weeks, and bring your goods by to our facility at 836 E. 86th St. The food drive, again, starts 11-27 and runs until 12-29. Thanks in advance for helping The Guyer Institute and Synergy Spa…help the hungry.